This is an excerpt from the introduction to the book on the Sea Eagles, my new book from Breakaway Books. I think it sums up my philosophy fairly well. I’m in love with boats and I’m in love with sail boats in particular. There is something very satisfying about a sail boat gliding through the water, sails full of wind. They seem to come alive as the wind pushes them forward. For me, the sound of the water on the bow, the wind moving through the rigging and the feel of the tiller in my hand all contribute to the pulse of the boat. And it’s the pulse of the boat that speaks to my heart. I feel it every time I step on board a sail boat and I yearn for it when I’m ashore. 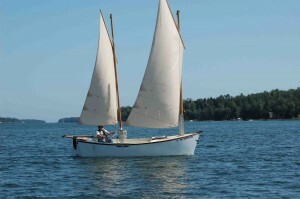 This feeling has shaped the way I interact with sail boats – the way I choose and design sail boats. And while I may love all sail boats I pick my personal boats the way I pick a friend or to be more accurate, the way I would choose a mate – with care and thought. 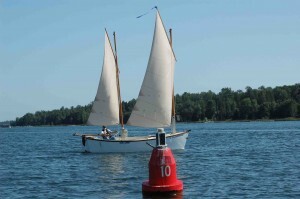 I see selecting a sail boat and more specifically, selecting a sail boat to build as a long term commitment. 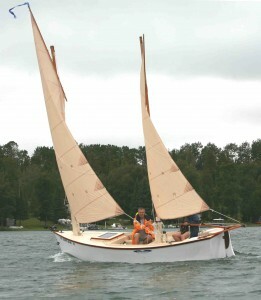 Most sail boats, unless they are incredibility simple and boxlike, will require a substantial period of time to build. Given that kind of time commitment I have devoted some careful thought to what I want in a boat. I spent some time thinking about where I realistically want to sail, not only today but say ten years from now. Most of us dream about sailing off into the sunset to wander the oceans of the world. But for me, that just isn’t practical, for that matter it isn’t practical for most of us. 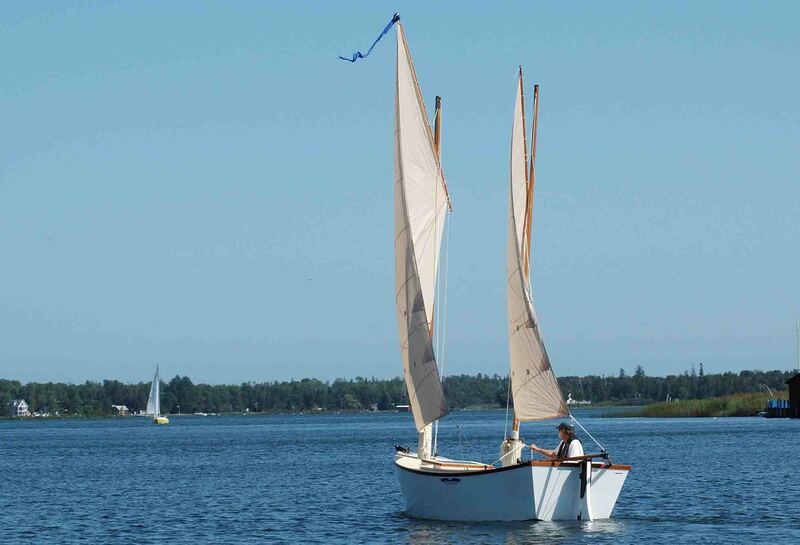 What I do find practical is a small, simple beach cruiser that I can sail in a variety of waters both big and small. A boat large enough to provide some creature comforts but not so big that her size limits where I can take the boat. The boats in this book fill that bill. Also, I want boats that are forgiving and I designed the Sea Eagles to be forgiving. You’ll find the both boats stable to at least 90 degrees of heel and the cockpits are self bailing. The heavy bottom and generous fixed ballast in the keel help to bring her back up in case of a knock down. 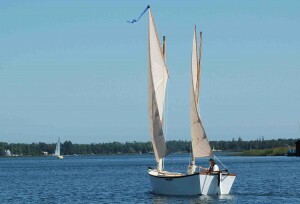 Her tandem center boards keep her balanced on all points of sail and well mannered in a following sea. Good manners and a forgiving nature are crucial but I think a sail boat that is easily launched from a trailer is important as well. Boat slips are expensive and are becoming increasingly hard to find. A boat that lives on trailer doesn’t need a slip and has a virtually unlimited cruising ground. 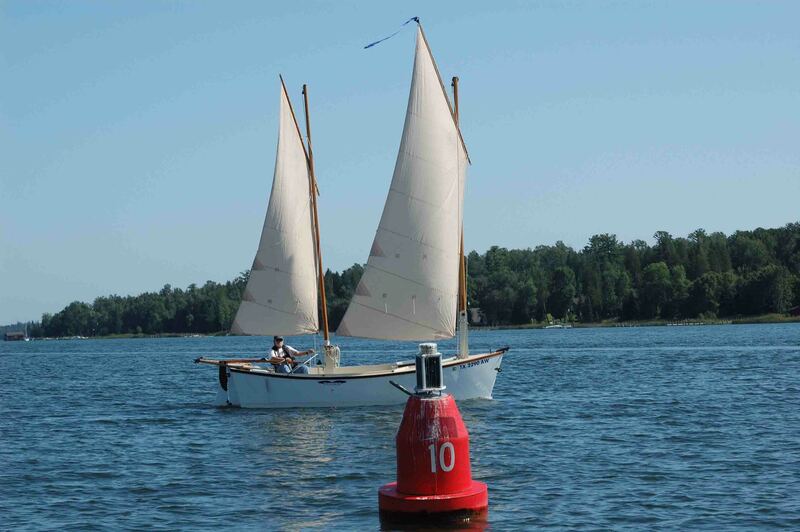 Sea Eagle’s free standing masts and simple traditional sails mean the time spent getting ready to launch is short and her 15 inch draft makes her as easy to launch as a power boat. I spent a summer sailing the boat on Lake Huron with standing lug sails and I love lug sails. The sails are fast and easy to rig. They are reasonably weatherly, easy to handle, and I particularly like the ability to brail up the sails. They proved to be excellent sails for this beach cruiser. The balance of the boat was very good with just a slight weather helm. 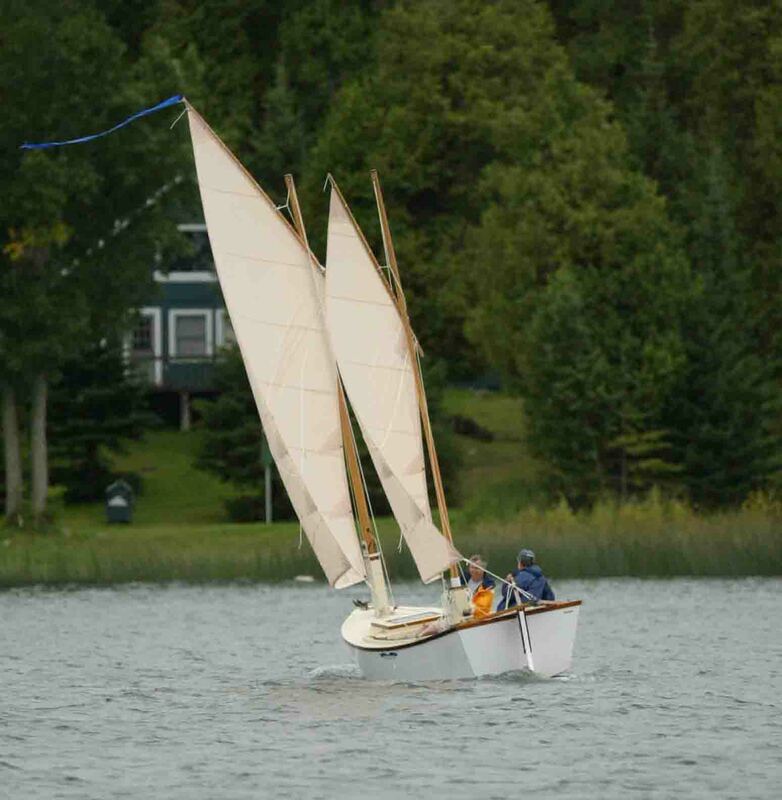 The sails proved easy to handle single handed and were really fun with another person to handle the main sheets. But with me boats are always a work in progress so I decided to change the main sail to something a bit different. The new rig used a batwing main with a boom and I added a boom to the mizzen standing lug. So the new rig had a halyard for the main and a halyard for the mizzen, a sheet for the main and a sheet for the mizzen, and lazy Jacks for each sail. 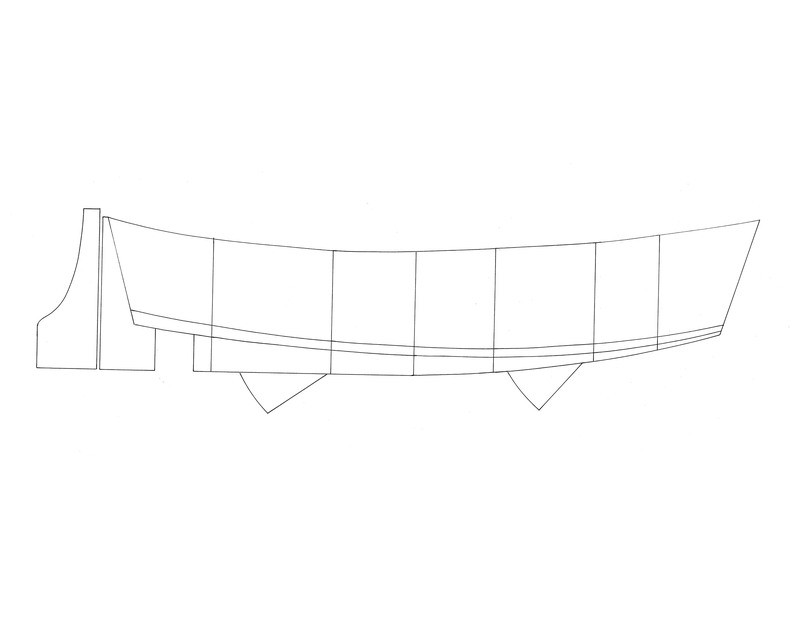 I planned to add Jiffy reefing for first reef and second reefs for both sails, and a down haul for the main. This made for a very complex rig. The original rig had a halyard and brailing line for both sails (total of 4 lines), two sheets for the main and one for the mizzen (total 3 lines) and a rigging time of less than 30 minutes solo. The complexity of the batwing was too much actually. 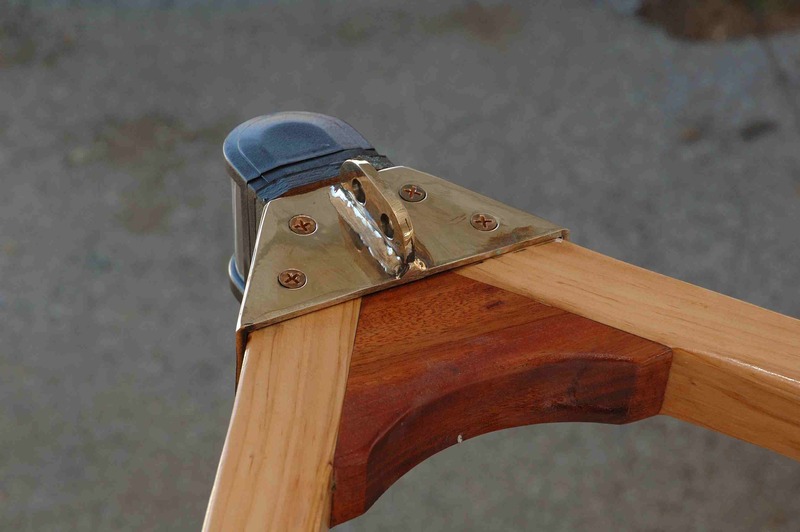 So I put the boomless standing lug main sail back and left the boom and lazy jacks on the mizzen. This has proven to be a nice rig and for the owners sailing off a trailer probably the best. Also I did have some problems with the battens on the batwing. 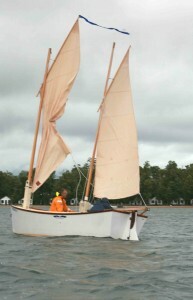 The weight and angle of the battens caused the sail to slide around to the side of the mast. As a result the sail set poorly. When I get around to changing the angle of the battens I may go back to the batwing but I do like the simplicity of the standing lug sails. 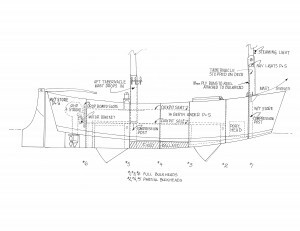 Is this sail plan set in concrete? I doubt it seriously. Originally I had intended to change to a schooner rig but the CCOE moved too much so I abandoned that rig, for a while anyway. So many sails so little time. There is an extensive chapter in the new book on how to make the sails for the Sea Eagles. The purpose of the chapter is to give the builder the knowledge and confidence to make the sails as well as build the boat. I think I can safely say that any boat I build from this point forward will have tandem boards. I love them. Here is an excerpt from the chapter on building the center board cases. First of all both these boats use tandem centerboards and when you tell people your boat has not one but two center boards they will look surprised and ask you why. 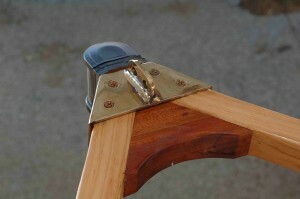 Tandem boards, either fore and aft or side by side, are unusual. There is a reason tandem boards are not the norm. Like everything else in boat building, tandem boards have advantages as well as disadvantages and until recently the bad outweighed the good. Let’s start with the disadvantages. Up to the appearance of epoxy in boat building, a center board case could be a leaking hole in the bottom of your boat. They could be made water tight at first but sooner or later most would start to leak. When the leak became bad enough you had to either haul out and fix it or get rid of the boat, leaving someone else to deal with it. Given that scenario it’s easy to see why people were very reluctant to put yet another hole in the bottom of their boat. Of course, there was the added negative that it was twice as much work putting in that extra hole that was going to leak. But in spite of those negative points some designers did draw and build boats with tandem boards. 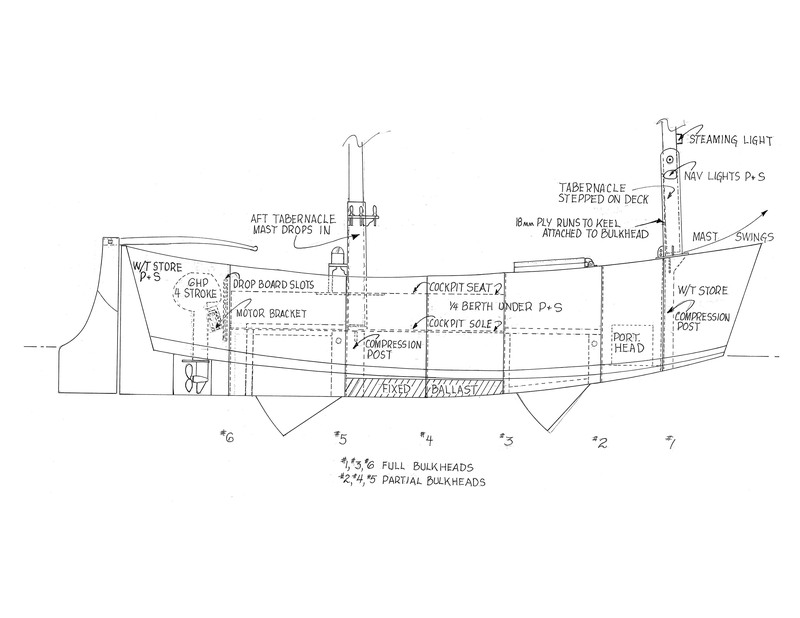 Spaulding Dunbar was one of those designer/ naval architects that did a few boats with two boards and I studied his work very closely. What I found convinced me that tandem boards did have worthwhile advantages. Probably the biggest advantage is the ability to fine tune the helm of the boat. 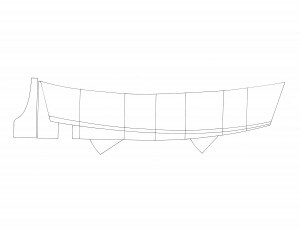 More specifically by raising and lowering the two boards it is possible to move the center of lateral resistance of the hull in relation to the center of effort of the sails. This was the main reason I chose tandem boards. Another reason was tandem boards allow the cases to be located where they were less intrusive. In a small boat, it is hard to find something more intrusive than the center board case right in the middle of everything. And finally two boards tend to give boats better windward ability in shallow water. They work more effectively than one deep board that has been drawn up into the case. And of course the Sea Eagles are designed as beach cruisers. 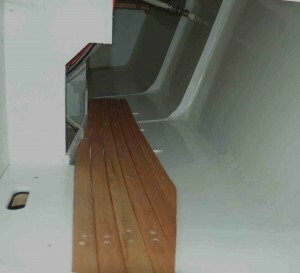 With both boards down the Sea Eagle 16.5 has almost 3 square feet of center board and draws only 28 inches. It would be difficult to have a single board with 3 square feet of surface under water and still draw 28 inches. 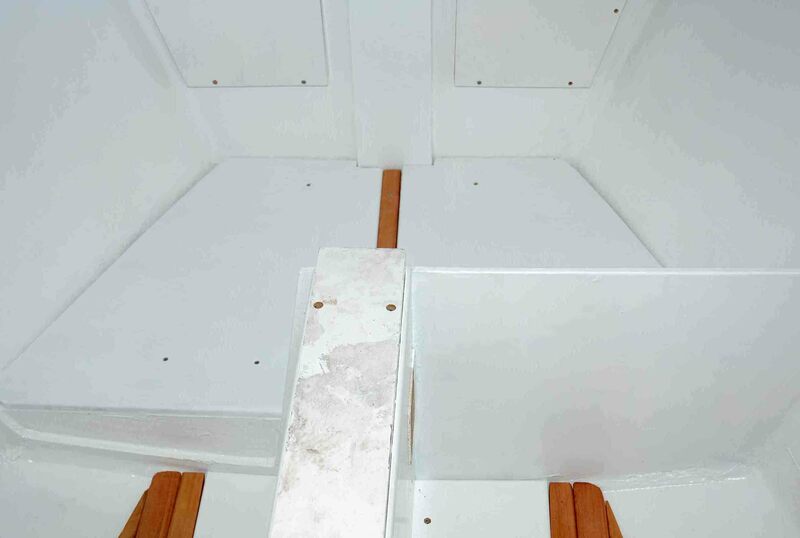 It’s important to note that both boats have a long shallow keel and the boards are meant to supplement the keel not be the sole source of lateral resistance. These are all good points. But when put on a balance with the big leaking hole, the scale always tipped in a dramatic fashion until epoxy took the leaking hole out of the equation. With the big leaking hole off the balance, the scale tips in the other direction, in my opinion and that’s why these boats have tandem boards. The chapter on building the cases and the boards is very detailed. The cases are somewhat complex but not difficult to build. There are 72 photos and drawings plus lots of written description that take the builder through each step so even a novice builder shouldn’t be intimidated. I’ve been very happy with the performance of Pandion (the Sea Eagle 16.5). The two boards seem to work very well with the long shallow keel and while the boat doesn’t point like an ‘around the buoys’ boat she doesn’t make any leeway (the heading on the compass and GPS have always been the same when I have checked) and the boat tacks through about 100 degrees. Not bad for a boat that draws 28 inches with the boards down. I thought the boat might be a bit sluggish as it tacked because of the two boards but it answers the helm in a very positive manner. 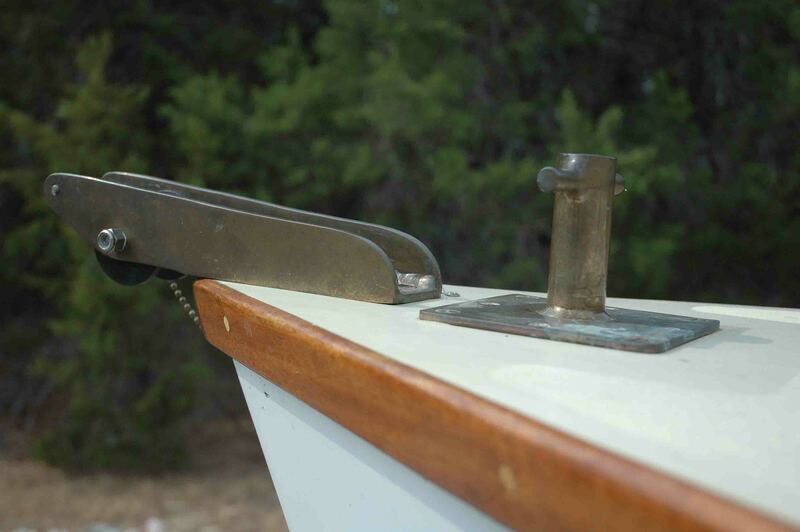 I seldom will raise the aft board when tacking because it’s added work and not necessary. 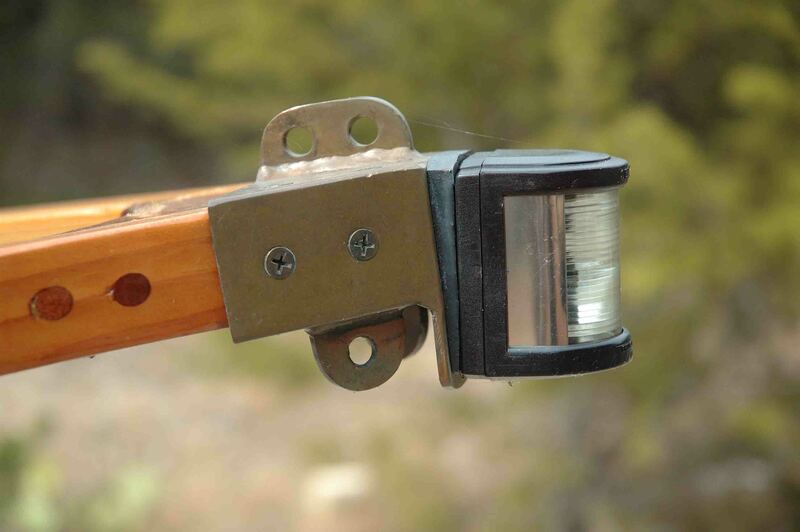 In very light winds it helps the boat come through the eye but that’s the only time it’s needed. I originally drew the 16.5 with a huge cockpit. Both boats ( the 16.5 and the 14.5 ) are beach cruisers so a large cockpit makes good sense. But when I turned the boat over I felt that a small cuddy was a good idea. There are times when sleeping below decks is just more comfortable than a cockpit tent and the volume in the hull almost demanded quarter berths. I’m glad that I opted for the cuddy. It gives great storage for gear (actually enough for very luxurious beach cruising) and a cozy place to sleep in cooler weather. I think it extended the time the boat can be cruised to late Fall and early Spring. I suppose in southern climates I see no reason you couldn’t cruise year round. 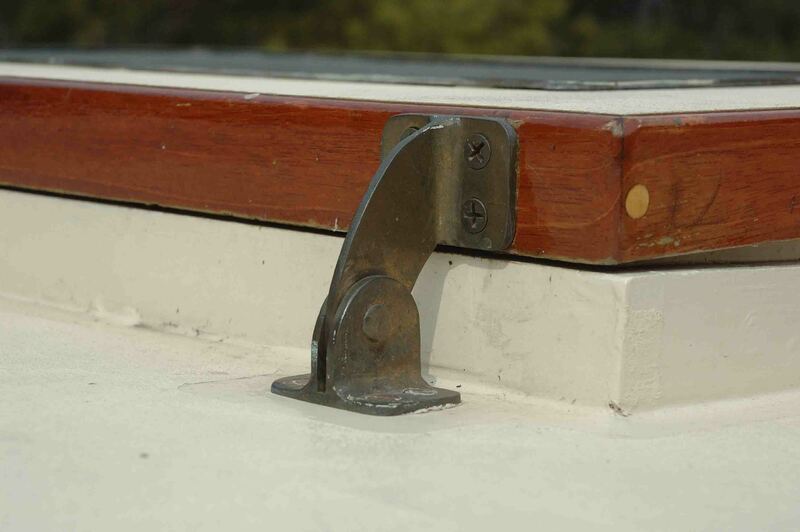 We fabricated all the bronze hardware on the boat and the drawings for the hardware are in the book. If the builder knows how to braze and weld they can duplicate the hardware or have the option to find a fabricator to do the work. Given the price of bronze I honestly think stainless steel is a better choice. I’m very pleased with the 16.5 Sea Eagle, Pandion. The boat draws very positive attention where she goes. On Lake Huron, I had people leave their docks and come out to ask if they could photograph Pandion. 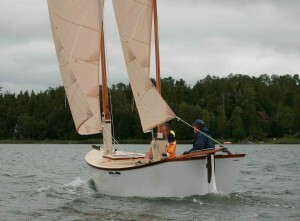 One guy was in a fully restored early 1950’s Chris Craft. That makes an owner/builder very proud.